It’s quite possible that independently produced documentary films have become the last bastion of truth, a form of investigative journalism created by filmmakers who firmly believe that the best resource for any democracy is a well informed electorate. The Vari4nt is a story about how some people posses a genetic variant that produce thoughts of homicidal and suicidal ideation after ingesting psychiatric medication- and many scientific reports indicate hard links to every mass shooting in America since 1998. Currently, the number of people taking psychiatric drugs in the United States is over 80 Million. Out of that group, over 7 million are under the age of 18. This project is for them. 1 IN 6 AMERICANS ARE TAKING PSYCHIATRIC MEDICATION. TEASER #3: Can psych meds make us VIOLENT? Over 7 million kids (under 18) take psychiatric drugs. This project is for them. This is a story about victims of unmitigated violence, billions in “happy pill” profits, and a potentially new breed of monster. It's a true crime story that is in dire need of a real eye-opener, an epic saga with no third act. A dyed-in-the-wool American tragedy. It is the sincere hope of this writer that if this series gets produced, a truth seeker might watch it, and stand up. Maybe that is simply us. You would think that 10+ years in the entertainment industry, finding interest in such an incredible narrative should be easy as pie, benefits to society aside. The truth is, the subject matter is too controversial, the implications too severe, the stakes are too high. It's quite possible the only way a film series with such a contentious subject matter can get produced and/or avoid censorship is to do it independently- through crowdfunding, a by the people for the people kind of thing. That's why I built this page, to find an audience, and to find support. In the summer of 2011, Dr. Yolande Lucire, a forensic psychiatrist, and Christopher Crotty, PhD in Cell and Molecular Biology, both published a study that focuses on the relationship between genome anomalies, psychiatric drugs and severe akathisia, enabling a person with no prior history to commit heinous acts of unmitigated violence. The study suggests, among other things, that the violent phenomenon known as mass shootings are connected to those who have taken psychiatric medication. Even to a layperson such as myself, I found myself horrified as harrowing details were unveiled in the ten first-person accounts depicted within the case study, made all the more terrifying knowing that EVERYTHING WAS REAL. "It then occurred to me that vital information was not getting to the people who needed it the most, the young millennials of our time." As I continued my research I became amazed at the amount of available data on the internet- it took a mere matter of seconds to collect more material I could consume in a day, yet 1 in 6 Americans are taking psychiatric drugs with the possibility of extremely violent side effects- despite the availability of healthy alternatives. It then occurred to me that vital information was not getting to the people who needed it the most, specifically, the young millennials of our time. Is there a way to present the facts as a credible documentary that appeals to millennials of all ages? Ask your doctor if murder-suicide is right for you. 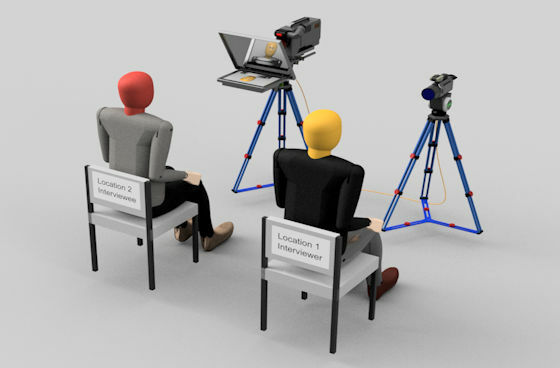 Using a specialized camera rig called The Interrotron, each episode begins with interviews from specific members of the scientific community. Together they will pull reports, excruciating details and factual assertions from their own published case studies and immerse the audience with real-life tales of serotonin toxicity mixed with extreme tragedy. Everything from suicides to mass shootings, committed by people without any prior history of violent or suicidal tendencies. 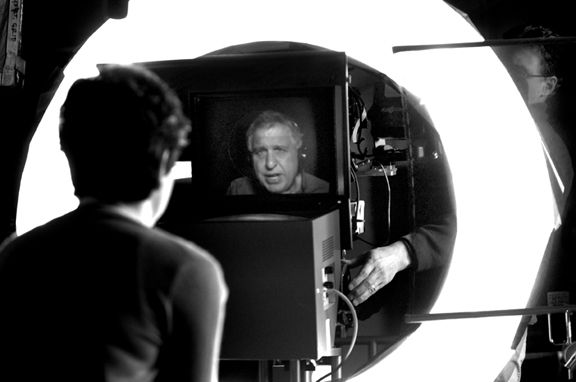 The Interrotron, invented by renowned documentarian Errol Morris. THE VARI4NT is designed to reach younger audiences. As interviews become narrated re-creations, the audience has no illusions- this is real. This really happened. Lines between documentary and horror genres will certainly be blurred, but our audiences will be riveted, terrified, and educated. "..the audience has no illusions- this is real." Demystify and discuss the science behind psychiatric drugs, violent akathisia and serotonin toxicity. It will also introduce the family of genes known as CYP450, and how they relate to drug metabolism. We will explore, in great depth, 10 documented acts of extreme violence, discuss whether or not the perpetrators were imprisoned or exonerated, and why. Using further case studies as a baseline, we will discuss whether mass shootings could be caused by adverse pharmaceutical side effects, and less so with the availability of firearms- or not? Let’s hear from parties on both sides of the fence. Assuming we can assign partial responsibility to psychiatric drugs, we will also discuss whether or not it’s possible to prevent the next akathisia-related tragedy by way of scientific investigation and testing, or is stricter gun legislation going to determine whether or not our kids live - or die in their classroom? Dr Lucire is a forensic psychiatrist. Research is the cornerstone of her professional expertise and has formed the basis of Dr Lucire’s current work in pharmacogenetics, focusing on why adverse drug reactions occur, and personalised medicine, the safe prescribing practices necessary to ensure that they do not. 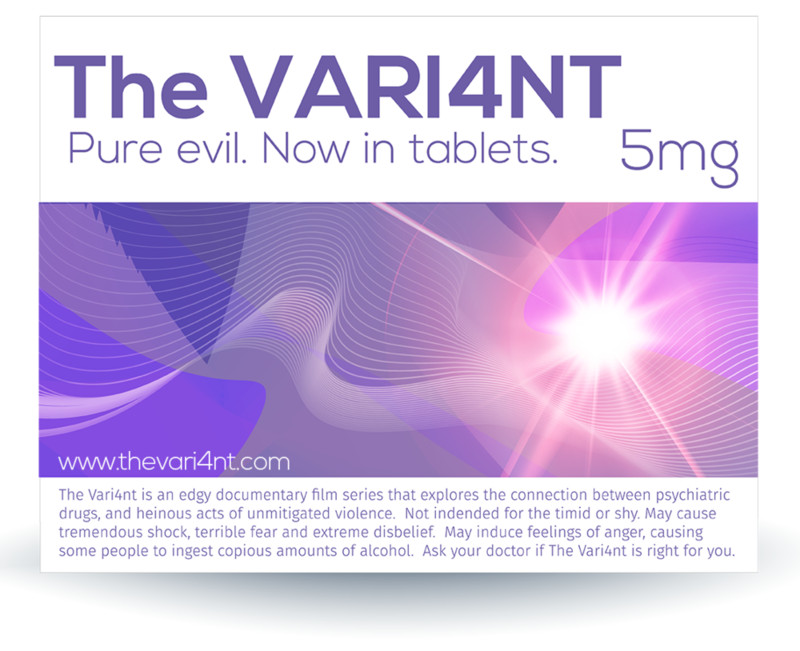 Inspired in part by the work of Dr. Kelly Brogan and investigative journalist Robert Whitaker, The Vari4nt is a provocative documentary series that explores the connection between psychiatric drugs and akathisia induced violence. In 2008, approximately 5.2% of US adults aged 18 to 80 years used benzodiazepines. The percentage who used benzodiazepines increased with age from 2.6% (18-35 years) to 5.4% (36-50 years) to 7.4% (51-64 years) to 8.7% (65-80 years). Benzodiazepine use was nearly twice as prevalent in women as men. The proportion of benzodiazepine use that was long term increased with age from 14.7% (18-35 years) to 31.4% (65-80 years), while the proportion that received a benzodiazepine prescription from a psychiatrist decreased with age from 15.0% (18-35 years) to 5.7% (65-80 years). In all age groups, roughly one-quarter of individuals receiving benzodiazepine involved long-acting benzodiazepine use. Despite cautions concerning risks associated with long-term benzodiazepine use, especially in older patients, long-term benzodiazepine use remains common in this age group. More vigorous clinical interventions supporting judicious benzodiazepine use may be needed to decrease rates of long-term benzodiazepine use in older adults. After a high-profile homicide case, there is often discus- sion in the media on whether or not the killing was caused or facilitated by a psychotropic medication. Antidepres- sants have especially been blamed by non-scientific or- ganizations for a large number of senseless acts of violence, e.g., 13 school shootings in the last decade in the U.S. and Finland (1). In September 2014, there were more than 139,000 hits from Google for the search terms “antidepressant, homicide”, and more than 1,050,000 hits for the terms “antidepressant, violence”. It is likely that such massive publicity in the lay media has already led a number of patients and physicians to abstain from antide- pressant treatment, due to the perceived fear of pharma- cologically induced violence. We have JUST LAUNCHED THE “28 days of Kickstarter” campaign, where every benevolent backer is righteously rewarded with astonishingly attractive apparel designed and curated by a collection of clever, charismatic and curious creatives who are every bit as formidable in film as they are fashionable. Vari4nt apparel is available only to our Kickstarter backers, to whom we are forever grateful for supporting this important film. To find out more about becoming a supporter, subscribe to our newsletter using the form below, or by clicking the little button to the right. Back us on Kickstarter, and we'll put a shirt on your back. TAKE ME TO YOUR KICKSTARTER! Yes! I would love to support the making of this film. Please send me your newsletter. AD Parody. Not a real product.